Been training in ----- for about a year. In my school we don't punch anything hard but my sensei has us round kick the heavy bag with our shins. Man that s#!t hurts! 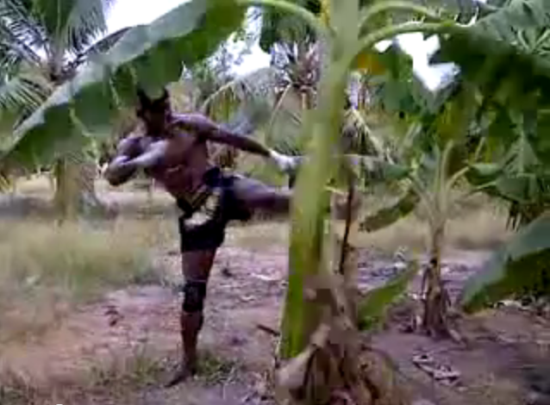 He [the instructor] says the thai boxers have shins like steel, this is the way to do it. What do you think? My legs are all lumped up now I'm thinking of quitting. Among other things I advised him to let his shins heal before he resumes training. Like makiwara training for punches, shin-striking hard or semi-hard objects are not my forte. I've never really been schooled in this method, but I'm guessing that the shinbone (tibia) should not take the full brunt of impact, but when performing the roundhouse kick the toes should be angled down a bit so that the muscular part of the shin (tibialis anterior) makes predominate contact. In Muay Thai shin-strikes are a signature move. There's a lot of controversy and misunderstanding about shin-striking delivered as a roundhouse kick. Traditionally, Muay Thai fighters would kick banana trees till they keel over. Banana trees, unlike most North American variety, are relatively soft and flexible. Still, being able to fell one is a formidable task. It's not hard to fathom how novices would end up crippling themselves after hearing about these feats. It's debatable as to the effectiveness of shin conditioning in the martial arts. Some use a rolling pin device for the shins to deaden the nerves, thereby raising the pain threshold. There is also a psychological component involved concerning pain tolerance. According to Wolff's Law, bones that are subject to incremental overload will respond by becoming stronger and denser. Evidence suggests that activities such as weightlifting and jumping support this thesis. Other research has revealed that microcrack damage actually decreases bone brittleness, making the bone less susceptible to further fracturing. A low-section roundhouse shin-strike to the opponent's outside thigh can be highly effective in a match, but it can come at a cost. In a UFC title match held in 2013 between Anderson Silva and Chris Weidman, the former attempted a low-target shin-strike that was leg-checked by the latter with catastrophic results. Silva had orthopedic surgery to repair his broken tibia with an intramedullary metal rod infused in the bone cavity. He is scheduled to resume fighting in 2015. I hate to say it, but every fighter Silva is matched with from here on out is going to target that left leg. He may also be gun-shy with kicking (or even checking kicks) with that leg, another impediment. I really think Silva should call it a day, unlike my reader with bruised shins who probably just needs a break (no pun) if he intends to stick it out in a school that he otherwise likes. Hopefully this young man won't continue getting hurt and is getting qualified coaching.